Is DraftDay Legit or a Scam? Scam! DraftDay was purchased by MGT Capital Investments Inc. in April 2014 for $600K and 100K shares of their common stock. A little over a year later on June 12, 2015 MGT announced it has signed an Asset Purchase Agreement to sell its DFS assets, which includes DraftDay by the end of the current quarter. MGT is reported to retain an equity interest in this new venture. Random Outcome USA Inc., the new entity created to purchase DraftDay, is planning on raising investor funds and will be managed by Sportech Digital, a subsidiary of Sportech Plc, which is one of the top B2B companies in the sports/gaming/tech sectors. There are a lot of things that are just broken, neglected, or abandoned with regards to DraftDay. I won’t even get into how it took them almost 6 months to respond to an email. 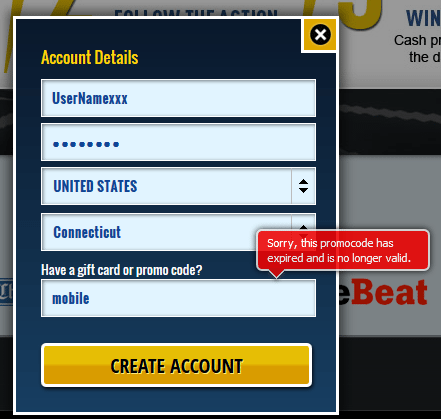 Promo codes do not work – if you enter any promo code into the text box, you will receive an error. Even DraftDay’s own promo code won’t work! It is hard to take a website seriously when very basic functionality fails to work. If this doesn’t work, then what else doesn’t work? Not a good introduction to the site when you are just simply trying to create an account. Why don’t they have their IT/Web Developer guy take 30 seconds out of his day and remove that field from the registration screen? Because they’re lazy assholes. There are no large Guaranteed Prize Pool (GPP) tournaments – in Sept. 2014, DraftDay conducted their $250K MLB Championship, their largest. Almost 11 months later, it appears to have been replaced with a $5K MLB promo tournament. LOL! In the DFS industry where most sites are exponentially increasing prize pools and payouts at a sky rocketing rate, year after year, how does this even happen? DraftDay offers PGA contests and the Open Championship on July 16, 2015 is coming up – which is one of golf’s biggest events and one of 4 majors played each year. On July 9, 2015, just a week away from the Open Championship, the lobby was filtered for just PGA contests and absolutely no contests were listed. The DraftDay lobby was rechecked later the same evening where PGA contests for the Open Championship were just made available, as evidenced by no entries in any contests yet. Other DFS sites that also offer PGA contests like DraftKings and FantasyFeud made contests available for the Open Championship three weeks ago. But hey, at least someone got around to listing these before the contest started. Ok, so the blog page is dead and is not being updated apparently by anyone. I’m beginning to wonder what the over/under is on how many people the DraftDay site employs. Let’s open it at say…3? Unlike other DFS sites like DraftKings, FanDuel, FantasyFeud, etc. 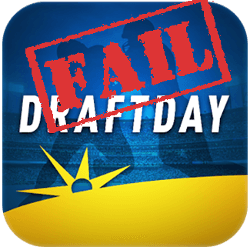 that offer mobile apps for both iOS and Android, DraftDay does not have a comparable app. DraftDay does have an app on iOS only for one particular game type they offer which is called Rapid Fire games. Well, I guess a partial app is better than nothing at all, right? Like FantasyFeud, DraftDay has a chat feature. Unlike FantasyFeud, there does not seem to be any moderators so if trolling/flaming is your thing, go hog wild! Whatever the DraftDay employees are doing, it does not seem like fixing code errors, writing apps, etc. are high on their “To Do” list currently. Is your money safe at a site like this? Due to its impending ownership change, DraftDay seems to be currently in hiatus. Hopefully the management of Sportech Digital will be able to improve the current state of affairs in the near future. But it’s hard to recover once you’ve tarnished your reputation and we recommend avoiding this epic fail. Find out what a good DFS site looks like – read our DraftKings review here and our FanDuel review here. How were your experiences with DraftDay? Let us know. I am trying to file complaints but cannot locate them on any BBB. Oh it's a scam alright. I have been waiting for my $5250 for over a week. The owner won't get back to me. No support, no app, no press, it's fake. I'm convinced it's a fake database for money laundering. Try to register for a game. You'll see.